Den of Thieves centers around an elite bank robbery crew with a military background as they plan their biggest heist yet. They plan to rob the Los Angeles Federal Reserve Bank, a bank that has never successfully been robbed before. Their group is linked to numerous bank heists that have all gone unsolved. Nick Flanagan (Gerard Butler) is a part of the Los Angeles Sheriff’s Department and has been tasked with taking this group down. From then on the film focuses on how these men will successfully complete this impossible heist without being taken down by Nick’s team. The film opens up with an amazing shootout at a heist that goes wrong. From then on you are almost bored to death with the poor pacing of the film. For a two hour and twenty-minute runtime, you, unfortunately, feel every minute of it. What makes matters even worse is the movie doesn’t take the time to develop any of its characters outside of Nick. You want to know more about how this group of men with ties to the military have turned to a life of crime. Instead, the movie decides to waste time on family drama in Nick’s personal life which adds nothing to the film. You never feel connected to any character, and most of the cast are supporting characters that will easily be forgotten after the movie is over. Overall, I had high hopes going into this film but due to the lack of action and poor character development, I left disappointed. This movie does not act as a bank heist but more of a boring cat and mouse chase. I would have to recommend you WAIT to see this film in theaters. This movie would be better suited for a Redbox night if you can dare to stay awake watching it on your couch. 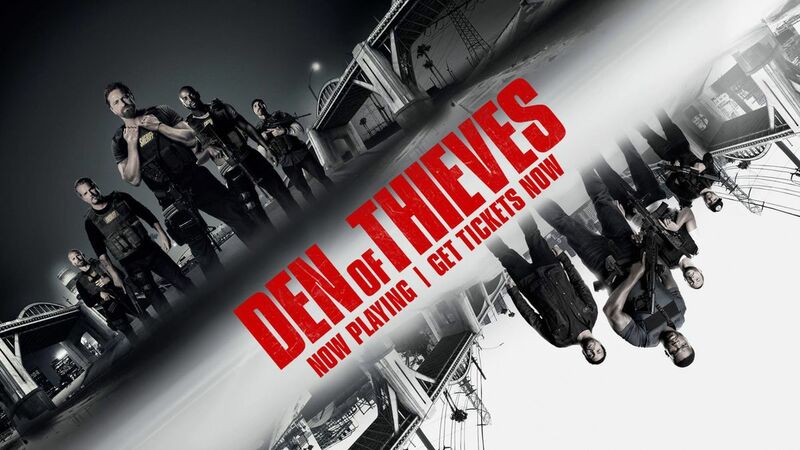 Den of Thieves hits theaters this Friday, January 19th. Purchase your tickets now at Fandango, so you don’t get sold out. Have you seen Den of Thieves? Share your thoughts on the film in the comment section below. I cannot wait to see this movie. The trailer looks exciting. I feel it is yet the best movie in 2018 thus far. Liking forward to a free at year. Great review Sharronda! You’re absolutely right! This film is slow and boring. Takes too long for the storyline to develop. By the time it starts to pick up, the movie is at the end. So disappointing, two has got to be better because there is no where to go from here but up!